Jennifer Annetts and Churinga Goldfire or one of Jennifer’s other endurance horses are a common sight riding along Red Range and Glen Legh Roads in the later afternoons and weekends, but this is no casual canter. Jennifer has been selected in the five-rider team to represent Australia in the endurance event at the World Equestrian Games to be held in Normandy, France in August, and she is in training to optimise her performance in the gruelling 160 kilometre one-day event. The World Equestrian Games is the largest equestrian event in the world, celebrated every four years (alternating with the Olympic Games). Endurance is one of eight equestrian disciplines contested. Ian Williams, Director Endurance Department, has taken the decision to retire at the end of this year after 12 years with the FEI. We would like to thank Ian for all his years of dedication to the FEI and we wish him a restful and happy retirement. In order to ensure a smooth transition, we are now looking for a Director to work with Ian Williams until his retirement in December and then take over full responsibility for running the Endurance discipline. The job description is available on FEI.org. Should you wish to apply or need any further information regarding the position, please contact the Human Resources Department at recruitment@fei.org. The evidence that emerged from last month's Compiègne CEI event in France would lead many to the conclusion that the gulf between what Western nations consider is acceptable in the sport of endurance and what the Middle Eastern nations think is OK is perilously close to insurmountable. The volunteer program is in full swing since most volunteers officiating at the 2014 Games have already been assigned. Overall, no fewer than 3,000 volunteers are expected to come to Normandy from 23 August to 7 September 2014 to help us organize the 7th edition of the largest equestrian event in the world! The Fédération Equestre Internationale (FEI) Bureau has unanimously approved Bromont/Montreal, Canada, as host city for the 2018 FEI World Equestrian Games. The decision came after the FEI Evaluation Commission’s report was presented at the start of the bureau’s two-day meeting at FEI headquarters in Lausanne, Switzerland, today. The Bromont Olympic Equestrian Park, venue for the Montreal 1976 Olympic equestrian events, will be the hub for the 2018 games. Bromont/Montreal is only the second host outside Europe following the Alltech FEI World Equestrian Games in 2010 which were staged in Lexington, Kentucky. “We are really delighted to award the 2018 Games to Bromont/Montreal,” FEI President HRH Princess Haya said. “The Bromont Olympic Equestrian Park is an exceptional and proven venue, and will be the ideal location for the eighth edition of the FEI World Equestrian Games, our most global equestrian event. The FEI had reopened the bidding process for the 2018 games in July of last year when the Canadian bid team for Bromont/Montreal was unable to provide the full public sector financial support that was required before an allocation could be made. Confirmation that the Canadian bid committee had subsequently secured substantial government backing was a crucial element in today’s decision. On June 19, Congresswomen Cynthia Lummis (R-WY) and Tim Walz (D-MN) introduced the National Forest Service Trail Stewardship Act of 2014 (H.R. 4886). The bill would direct the Forest Service to take several actions to help address the current trail maintenance backlog that is adversely impacting all trail users on many national forests, including equestrians. The AHC, Backcountry Horsemen of America, and the Wilderness Society were significantly involved in the creation of this bill. A June 2013, study by the Government Accountability Office (GAO) found that the Forest Service trail maintenance backlog exceeds a half-billion dollars, and only one-quarter of the agency’s 158,000 miles of trails meets agency standards for maintenance. This maintenance backlog is causing access and safety issues for equestrians and all trail users on national forests. June 12, 2014, Lausanne, Switzerland ~ Media representatives were invited to share insights and creativity in a discussion session on June 11 chaired by HRH Princess Haya of Jordan, FEI President, at HQ FEI, the HM King Hussein Building in Lausanne. Jenny Annetts, 27, has been riding endurance since she was eight years old and has completed more than 10,000km of competitive rides of 80km and above. After ten years of Pony Club in Glen Innes, Annetts went to Jamborree level, excelling at dressage and flat work events, but she found her real love was working with her horses to complete long distance competitions. Jenny finished her first 160km event the day after her thirteenth birthday. The Australian Endurance Team for the 2014 FEI World Equestrian Games was announced today. Lexington, Ky.- The United States Equestrian Federation (USEF) has named ten horse-and-athlete combinations to the Short List for the 2014 Alltech FEI World Equestrian Games U.S. Endurance Team. Additionally, three combinations have been named as alternates. Compiegne marked Mubarak's first ride back at an FEI competition since the Sakhir CEI** (Bahrain) on Feb. 8, where he received a yellow warning card and a fine of $560 after a video brought to light maltreatment of his horse by people on foot as they neared the finish line in the lead. They chased Tarabic Carl and even possibly hit him to encourage him to keep going. Mubarak was charged with “abuse of horse” and “non-compliance with applicable endurance rules” at Sakhir after the video went viral, causing an Internet uproar. At that point, the Bahrainian National Federation suspended both the rider and the groom involved in the incident until the end of the endurance season. Because Mubarak’s two offenses took place within a 12-month period, he’s banned from FEI competition for two months. His suspension will end on Aug. 11. Five riders in total received yellow cards at Compiegne. Three of those were horse-related abuses. In addition to Sheikh Mohammed, Faleh Nasser S.S. Bughenaim of Quatar and Sheikh Hasher bin Mhod Thani Al Maktoum of the United Arab Emirates received yellow cards for "maltreatment of a horse." Compiegne was also the event where an extremely thin horse was allowed to start the 160-kilometer CEI. Bahrainian rider Raed Mahmood rode Shakla's Sudden Impact. The horse did vet out at the second gate for lameness. Another horse, L Emerita di Gallura, died after being vetted out for metabolic reasons at gate 2 in the CEI. Organiser Jenny Shepheard said the ride offered something for all levels, with 80km, 40km and 20km events, and that new entries were welcome. Mrs Shepheard said a new ride based on “a flat grassy paddock” was a big improvement on past events. “We have held two rides in the past and have had access problems so we have a fantastic new ride base,” she said. ABU DHABI/DUBAI, June 17 (Reuters) - The United Arab Emirates (UAE) government advisory council passed a draft law against horse doping on Tuesday, aiming to clear a reputation tarnished by doping scandals in flat and endurance races. The bill, which covers all equestrian disciplines from racing to polo, outlines financial penalties from 20,000 to 500,000 dirhams ($5,400-$136,100) for various doping offences. A supervisory authority can also ban individuals from the sport for three years. In case of repeated offences a lifetime ban is an option. "This is the first legislation on the level of law. Before there were just some regulations governing it," Rashid al-Shuraiki, the head of a Federal National Council (FNC) committee in charge of drafting the bill, told Reuters. "We tried ... to have everything in it and not leave any loopholes, to give confidence to all participants in races in the UAE and to the UAE when it participates in races abroad," he said on the sidelines of a six-hour discussion about the draft. Angered by doping in his Godolphin stables last year, UAE Prime Minister Sheikh Mohammed bin Rashid al-Maktoum initiated last May a decree that made the import, sale, purchase or use of anabolic steroids in horse sports a criminal offence under the UAE penal laws. Godolphin's reputation suffered a serious blow when the British Horseracing Authority banned former trainer Mahmood al-Zarooni for administering anabolic steroids to horses at his Moulton Paddock stables in Newmarket. U.K. border authorities last year also seized a shipment of unlicensed veterinary goods from a Dubai government jet. The incidents caused serious embarrassment to Dubai ruler Sheikh Mohammed, Britain's leading racehorse owner and the world champion in endurance, who closed Zarooni's stables with around 200 horses and ordered internal investigation. Zarooni won the 2012 Dubai World Cup - the world's richest horse race - for Godolphin with Monterosso, as well as English Classics the St Leger and 1,000 Guineas. In September, Sheikh Mohammed's wife Princess Haya, who may run for re-election as a president of the International Equestrian Federation (FEI), appointed former London police chief Lord Stevens to oversee an internal inquiry into the sheikh's global equine interests. Lord Stevens's report cleared Sheikh Mohammed of any wrongdoing and concluded that Zarooni had acted alone. In a document to the 40-member FNC explaining reasons behind drafting the law, the committee noted "a lack of consistency in test results from laboratories" which led to credibility doubts, adding international certification would be required. The government is expected to send the draft to UAE President Sheikh Khalifa bin Zayed al-Nahayan for signing into law. The draft law also forbids trading in banned substances and the purchase of such a substance is only allowed with special permission from the government. Controlled substances used for treating horses for ailments do not require such a permission but they are banned during the competition season. The use of a number of mechanical and electrical devices used to massage horse muscles will also be banned, the FNC voted despite objections by a government minister that their use cannot be tested. Endurance racing in the UAE, where both horses and riders often battle gruelling heat and desert dust in races as long as 160 km (99 miles) in one day, has been also mired in doping and horse welfare controversy. Extreme sports. You can visualize what they are even before you hear the pulsating music that plays along with the TV coverage. The pictures of skateboarders in midair, upside down, defying gravity, are wondrous and startling. How do they stay attached to those skateboards? The key words that define extreme sports: adrenalin and rush. Imagine an extreme sport where determination replaces adrenalin and strategy replaces rush. Then spread the competition out over a period of time that overlaps one day's breakfast, lunch and dinner. One day's sunrise and sunset. Add some horses and a couple of rivers and mountains. Then give the sport a name that is both a promise and a challenge: endurance racing. It may not be as well-known as other branches of equestrian sports, but it is a clear and compelling connection to Americans' frontier past. Think about the Pony Express riders, racing across mountains, through snow and rain, night and day. Two of the most esteemed endurance races in America are the Tevis Cup, a 100-mile race from Squaw Valley, Nevada to Auburn, California, and the Old Dominion, a 100-mile race through Virginia's Shenandoah Valley and the Blue Ridge Mountains. On a recent sweltering June weekend, a young rider from Norristown, Pennsylvania, defeated some of the country's premier endurance riders in the 32nd Old Dominion race. And that was just one of the highlights of Daryl Downs' weekend. "He's absolutely remarkable! Only 10 horses finished because it was so hot. You talk about world class riders, and he beat them all!" Mike Marino, owner of Red Buffalo Ranch in Montgomery County, described his protégé's accomplishments. "Daryl graduated from high school Friday night, got up at 3:30 in the morning and drove to Virginia." Marino's enthusiasm and obvious pride erupt spontaneously as he talks about the convergence of events that brought a truly unique horse, an exceptional young rider and a seasoned endurance competitor together. Downs didn't think about horses at all until the summer he was 12 years old. His mother had sent him and his sister to camp at Red Buffalo Ranch. "This kid came to me at 12. He came here, got into our camp and has never left," Marino said. "I converted him into a trail guide." But the trail guide had some reservations. "It took me three years to get up enough confidence to lead the rides," Downs said. "I used to hang back on the slowest horses." Eventually, Downs began leading rides and then got interested in racing. "I started racing two years ago," he said. It wasn't that he was particularly athletic. He was looking for something different. "Nobody else did it, and it was something I was good at. People hear about it and think it's cool." Downs also wrestles. "Wrestling keeps me in shape for riding," and it also gives him something to do with all his energy in the winter. But what about the horse? That's another story of chances taken and prizes won. "Here's a horse I bought at New Holland for $700," Marino said. "Mike was getting ready to sell him, and I asked if I could try him," Downs explained as he described how the partnership between a novice endurance rider and a young horse named "Cincinnati" began. Marino chose the horse's name with a nod to history, and it turned out to be very prophetic. "It was the name of Ulysses Grant's favorite horse," Marino said. And it was in Virginia that Grant finally defeated General Robert E. Lee to end the Civil War. One of Marino's other great endurance horses is named Traveller, which was Lee's horse. Another Red Buffalo Ranch rider, Devon Hangey, was riding Traveller and keeping up with Downs for most of the race. Although final times have not been released yet, Downs thinks it took him about 17 hours to finish the race. "The closest anyone was to him was about 10 minutes," Marino said. Not a bad trip for a relative newcomer. "That was my first 100. I did a 55-mile race in April and got a second in that," Downs explained as he described what it was like to ride through the day and into the night. 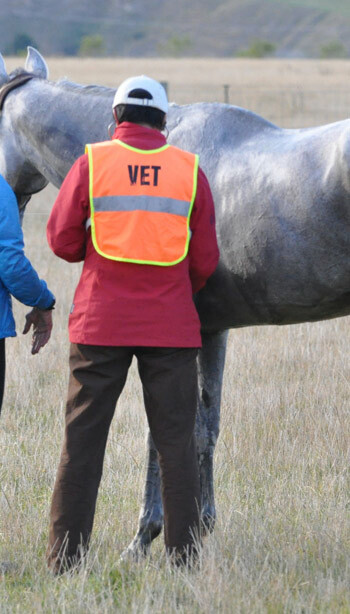 The pit crews meet the riders at the vet stops, where all horses are checked by veterinarians. The veterinarians can pull horses out at any of these checkpoints. The riders might grab a sandwich at the checkpoint, while the pit crew sponges down the horse. Downs' pit crew included his mentor Marino, an experienced and successful endurance rider who dispensed encouragement as well as advice. "Devon got pulled at 80 miles because her horse was lame. I was with someone a lot for the last five miles. Toward the end, Mike told me what I could be doing to make sure I stayed ahead." The race is as much about strategy as it is about speed. In fact, riders get bunched up together and stay together for long distances. "In the middle we were just hanging out, just trying to keep people from catching up to us," Downs explained. "The pace is pretty steady, trotting and cantering." After nightfall, things change. "It's hard. You don't really know where you're going and you hope the horse knows where he's going. There are glow sticks every hundred yards. That's how you know you're in the right place." The Old Dominion course follows a trail that is fraught with history. It starts at the Northern Virginia 4H Center near Front Royal, on a plot of ground originally purchased by the United States Army as an ideal place to train military horses. The trail ascends the Blue Ridge Mountains, and then descends to the Shenandoah River. The Indians named the river Shenandoah, "The Daughter of the Stars." Riders cross the river and follow the trail into Fort Valley and the Massanutten Mountains. The trail takes riders back across the river near Sherman's Gap, and then back to the 4H Center. "When we got out of Sherman's Gap, there were still other people with me." But then Downs and his horse made their move. "Cincinnati went flying up the hill. We stopped and listened for other horses. Then we went flying down the hill. He lost a shoe, and stumbled, but we kept going." Downs crossed the finish line around 1:00 a.m. He remembers the heat, the darkness and the camaraderie he shared with other riders—many of whom were far more experienced. "They say this is the hardest race. It's hard for me to say because I haven't done that many. It was very dangerous weather to be doing stuff like that," he explained. But he's a careful rider who pays attention to conditioning his horse and how his horse is feeling. "We don't ride with a heart monitor. I rely on what the horse is doing—listen to his breathing." The Old Dominion whetted his appetite for another challenge, and he's looking forward to his next race, the Vermont Moonlight 100 in July. Downs and Hangey worked together to condition Cincinnati and Traveller for the race. They spent weeks riding the horses up and down the hills in Evansburg Park, near the Red Buffalo Ranch. "We knew they were ready," Downs said. Then he recalled what someone once told him about endurance riding. "The one who trains the best is the one who has the most horse left at the end." This time the one with the most horse left at the end was an 18 year-old who had just graduated from high school, riding a seven-year-old horse named for one of the country's most successful—and controversial—military leaders. His Highness Sheikh Mohammed bin Rashid Al Maktoum, Vice-President and Prime Minister of the UAE and Ruler of Dubai attended the Italian Endurance Race at Ancona at which the Dubai Crown Prince Sheikh Hamdan bin Mohammed bin Rashid Al Maktoum clinched the title for the second year in a row. With riders from 13 countries taking part in the event, Emirati riders dominated all four stages of the 120-km race and won the first three places. Horse lovers from all over the world will be riding their way into the small hamlet of Berwick at the end of this month for the annual Stormont Endurance Race. For over 10 years, the Ride has taken place in Berwick and over the past few years it has grown from a small local ride to an international event. According to a press release from Sharon Anderegg, Logistics Manager of the Ride, there are only one or two events at this level in Canada and those take place out west. I spent much of my childhood in the saddle, or longing to be in the saddle. Horseback riding was my great passion, and I pursued it whenever I could. However, upon moving to Turkey, I turned my back on the sport. I had young children now, and without transport to get to and from the stables, riding just wasn't feasible. Six years ago a friend who wanted to start riding dragged me to a stables. Since that day, I have been trying to ride, on and off, whenever I can. Growing up in the United States, riding was the sport of cowboys; it belonged to the people, and anyone could do it, without spending a fortune on fancy gear. You could gallop through the hills, jump over rivers, feel the wind on your face, all for a small fee. But in Turkey I saw that everyone was in shiny boots, spanking new jodhpurs and a luxurious velvet hard hat. The price of such equipment here makes this is a serious investment, and once you have made it, you feel compelled to go on. If the student wants to buy their own horse, this is even more of an investment, with the most basic horse starting at a price of around 30,000 euros. However, a few years ago I met Efe and Yasemin Çehreli, who run Sırapınar Country Club. They have a different approach to equestrian sports. Efe started riding in 1998 as a hobby. But he was dismayed that this was a sport for the elite, and anyone who did not have the money to purchase a potential champion was scorned. He knew that horses run in the blood of Turks; in Turkish history the horse was a revered and treasured companion. But what Efe saw was that the horse had now become a vehicle of status, being divorced from its historic past. As of May 31, 2014, USA's Emilynn Dibassie continues to dominate the Young Riders World Endurance Ranking, with over 100 points ahead of second place Teresa Sanchez of Uruguay. France's Nina Lissarrague is third. USA riders Taylor White and Taylor Stine rank 4th and 5th. French riders hold the first two spots on the FEI Open Riders World Endurance Ranking. Philippe Tomas tops the list followed by Jean Philippe Frances. USA's Willemina DeBoer ranks third. Jeremy Reynolds has the 11th place, and Cheryl Van Deusen is 15th. UAE riders hold the first two spots in the Open Combination World Ranking. Saif Ahmed Al Mozroui and Nopoli Del Ma are first, with Saeed Mohammed Khalifa Al Mehairi and Kedjari Des Serres are second. Tunisian rider Abdelkader Aouini and Nesseb are third. Steve Rojek and Trident are the highest ranking US rider in 12th. A former church treasurer has been charged with murdering his horse rider wife by swerving off a motorway and smashing their car into a tree. Tracy Maria Walters, 48, died in hospital two days after the collision on the M1 near Markfield, Leicester. Her husband, Ian John Walters, 50, was behind the wheel of the black Mitsubishi L200 Animal when they careered off the south carriageway into a tree on March 21. Mr Walters was also flown to Coventry's University Hospital with serious injuries but survived. Today police confirmed Walters, a former Parochial Church Council treasurer at Christ Church in Swindon, Wiltshire, has this week been charged with Mrs Walters' murder. A spokesman for Leicester Police said he appeared at Leicester Crown Court on Monday and was remanded in custody to appear again on June 23. The FEI Bureau has today approved the revised Endurance rules during the second day of its in-person meeting in the FEI Headquarters in Lausanne (SUI). The revised rules, which are in line with the recommendations of the Endurance Strategic Planning Group (ESPG) and which received widespread support at the FEI Sports Forum in Lausanne (SUI) in April 2014, will be implemented on 1 August 2014. Additionally, and in order to more formally recognise the HRH Princess Haya’s previously stated conflict of interest with regard to the discipline, the Bureau voted unanimously to officially mandate the 1st Vice President John McEwen to take over full responsibility for the entire Endurance discipline during Princess Haya’s term of office. The FEI and the National Federations have consistently stressed the importance of putting the new rules in place as soon as possible rather than waiting for a vote at the FEI General Assembly in December, which would mean delaying implementation until 1 January 2015. Under Article 20.3 of the FEI Statutes, the Bureau can, in emergency situations, pass resolutions that are normally voted on at the General Assembly. Brian Sheahan, Chair of the FEI Endurance Committee and a member of the ESPG, welcomed the rapid implementation of the new rules. “The new rules for Endurance are a great step forward for horse welfare and fair play, and we strongly believe they address the key issues that the discipline has been facing,” he said. “We are all aware that the discipline has faced a number of difficult challenges recently, but the combination of the ESPG, the consultation process with the National Federations and other stakeholders, and the determination of the Endurance Committee and the team at FEI Headquarters to address the issues within the discipline has resulted in some fundamental rule changes specifically aimed at improving horse welfare protocols and ensuring a level playing field globally. In addition to the new rules and in response to one of the ESPG recommendations, the Endurance Task Force is looking at ways that new technology can also be used to ensure horse welfare and provide a level playing field for Endurance events around the world. Following on from the strong support for the far-reaching initiatives outlined at the special Endurance session at the Sports Forum, a large number of the leading Endurance National Federations have expressed their further support in writing. Under Article 20.3 of the FEI Statutes, National Federations have 30 days to object to the amendments to the Endurance rules, but further changes can only be made if a majority of National Federations register their objections within the specified timeframe. The new Rules for Endurance to be implemented on 1 August 2014 will be published shortly on the FEI website here. Any media requiring a copy of the rules should contact the FEI Press Team at press@fei.org. At its meeting this weekend, the Board elected John Hudson as the new Chair of Endurance GB, supported by Peter Claridge as its Vice Chair. In recognition of the importance of Rides and Rules to its Members and to horse welfare, the Board also decided to create separate sub Committees for these core activities, and is pleased to announce that Jeni Gilbert has been appointed Chair of Rides and Julie Martin as Chair of Rules. The Board looks forward to continuing to work with its Members over the coming months to promote and develop the sport we all enjoy at every level within Great Britain. My Uruguayan friend Oscar Ricca and I provide the list of Uruguayans pairs selected for the next World Raid 2014, to be held in August in Normandy (FRA). Among these selected riders is Oriana Ricca, who with encouragement, love and suffering has achieved in the last classification of Castelsafrat CEI *** (FRA) on the back of the Spanish mare Jon Fernandez "Talita Kumi 50%," with which she will participate in the World. Oriana Ricca with "Talita Kumi 50%." Jorge Martinez with " Nagfour ". Veronica with Koncke "Pharaoh of the Soul ". Isha Judd "JQ Zarial ". Federico Garcia with " EO Rabbis ". Good luck to our Uruguayans in the coming World Raid 2014 friends. Excitement and adrenaline are growing by the day In Italy, host of the next 2014 European Championship Juniors and Young Riders. The event takes place for the first time in our country and the blue team do not want to make a bad impression during this outstanding international appointment in which we definitely play the leading role as the host nation. The Endurance Department of the Italian Federation of Equestrian Sports (FISE) has already prepared a list of pairs which will participate in the selections for the European Championships. UAE riders continued their splendid performance with Ghanim Al Marri easing his horse Ro Al Lisain to a convincing win in the 100-km Shaikh Mansour bin Zayed Al Nahyan Endurance Festival Cup on the final day of the Shaikh Mansour bin Zayed Al Nahyan Global Arabian Horse Flat Racing Festival’s five day extravaganza came at the King’s Forest in Tetford, UK on Sunday. While Al Marri topped the pack of riders competing in the Purebred Arabian endurance horses’ category, the Spanish duo of Alejandro Dachs Izquierdo and Nuria Serrabassa Fabre made it a 1-2 in the category for Purebred Arabian horses that have earlier in their careers races in flat races. Alejandro on Zen Al Maury and Nuria on Tidjari, two flat-race horses now in endurance, did very well to win the 100-km One Star which was run in four stages of 32kms, 32kms, 20kms and 16kms. The Fédération Equestre Internationale’s campaign to clean up endurance has suffered a setback due to an escalating outcry over a “skeletal” horse at the 160-kilometer CEI in Compiegne, France, on May 23. Dubai: The World Arabian Horse Racing Conference supported by the HH Shaikh Mansour Bin Zayed Al Nahyan Global Arabian Horse Flat Racing Festival concluded on a glittering note at the historic Guildhall in the City of London on Friday night. Abdul Rahman Ganem Al Mutaiwee, UAE Ambassador to the United Kingdom, presented the Conference flag to Asim Mirza Al Rahma, the UAE Ambassador to the Republic of Poland to announce that the 2015 6th edition of the annual conference will be held in Warsaw, Poland. Conference speakers, moderators, officials, Arabian horse racing breeders, UAE endurance riders, members of the media and envoys were felicitated at a dazzling ceremony that marked the end of the three-day conference.